CANBERRA, May 28-- China's defense white paper "makes an important contribution toincreasing transparency concerning military capabilities and strategic intent," a spokesmanfor Australian Minister for Defense Kevin Andrews has said. "We recognize that military modernization is a natural part of any country's developmentand China is no different in this respect. 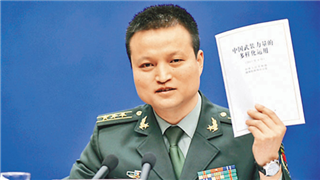 We encourage China to be open about its defensepolicies and capability planning," the spokesman said Wednesday in a written response toXinhua's questions on the white paper. China issued its first white paper on military strategy on Tuesday, stressing "activedefense" and outlining a strategy unifying strategic defense and operational and tacticaloffense. "Australia is committed to developing a strong and positive defense relationship with Chinathat enhances mutual understanding, facilitates transparency and builds trust," thespokesman for Kevin Andrews said. Meanwhile, the release of China's defense white paper received wide coverage by majorAustralian media organizations. The Australian Broadcast Company reported that China outlined the threats the countryfaces and how it intends to deal with those issues in the defense white paper. "China emphasized the importance of maritime security," the report said. The newspapers under Fairfax media group published a report from its Chinacorrespondent, saying,"China has signaled ambitions for a greater naval presence furtherfrom its shores." "The white paper bluntly warns against countries who it considered were 'busy meddling'in the South China Sea," the report said. The report noted that the People's Liberation Army Navy would gradually expand its"offshore waters defense" to include "open seas protection." The Fairfex report also noticed that China would speed up the development of a "cyberforce" which would enhance its capabilities in the event of being targeted by cyber attack. The Australian said that China "had no intention to relinquish its claims" over the disputedislands in the South China Sea. The Australian Financial Review said that China's white paper came as it emerged thatJapan will join a major U.S.-Australia military exercise in early July for the first time. The spokesman for Minister Andrews said Australia's cooperation with countries in theregion, including Japan,"is not directed at any one country," but instead aims to furtherstrengthen regional security. "Australia's bilateral relationship with Japan, much like our relationship with China, isimportant to Australia and continues to grow," the spokesman said.